Where: The Bertha Roman fort at NO097268, where the river Almond flows into the Tay north of Perth. It was named relatively recently as Bertha and lies across the Tay from Scone, the traditional site of coronation of Scottish kings, which was probably ancient Ταμεια ‘Tay crossing’. Name origin: The ending –danum resembles *danu, which contributed to the names of rivers across the ancient world that were somehow double, including two instances of Dano in Britain, and various rivers now called Don, including one not far away at Aberdeen. Initial Levio- also has to do with rivers, judging by the the element Lav- possibly associated with variable rivers as discussed here and by the discovery of Roman timber river-edging beside the lower Rhine at Levefanum and by the river crossing at Durolevo in Kent. A possible translation for Levio- is ‘embankment’, but it is not obvious that Bertha had a particularly unusual river bank. An alternative, possibly better, hypothesis is that Levio- referred to the weir itself. Latin had two similar verbs levo ‘to elevate’ and levo ‘to smoothe’ and of course a weir both elevates and smoothes water flow. Laevus ‘left’ is probably irrelevant. Notes: Crawford (1949:60-61) recognised Derder's Ford between Bertha and Scone as the remains of a former weir just downstream from a bridge that was probably originally Roman. (Although the Tay is Britain’s biggest river in terms of flow rate, during a hot, dry spell its depth of water at Perth can drop to an easily fordable trickle.) 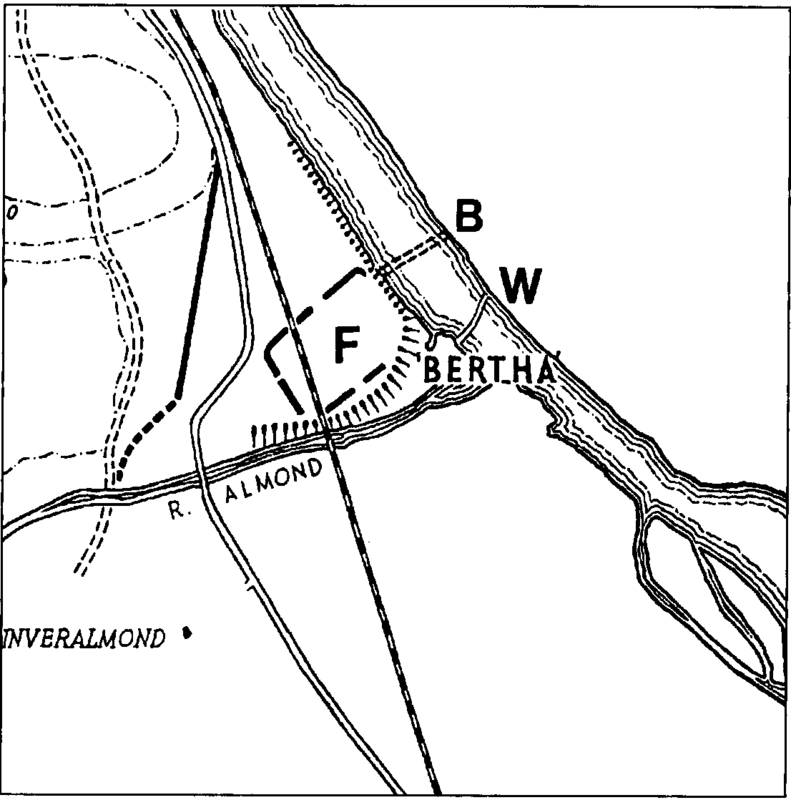 The diagram below, copied from Selkirk (1995 p259), shows the fort F, bridge B, and weir W in close proximity near the tidal limit of the Tay. Unfortunately, Raymond Selkirk is a hate figure for many archaeologists, who choose to ignore his clear explanation (pages 241-248) of the river engineering involved. So there has been no mature discussion of whether there were originally two separate weirs, or just “one curved weir that served to deepen both rivers”. Is it pure coincidence that Derder's Ford looks like Duro- ‘crossing’ twice over?